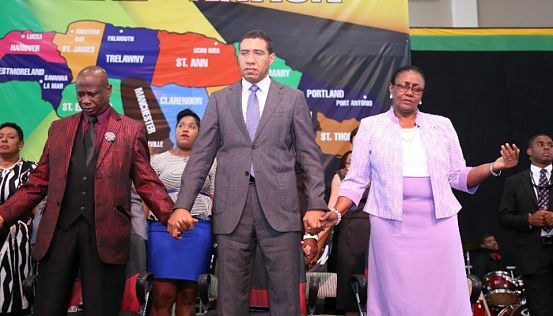 UNITED WE STAND: PM Andrew Holness (centre), Bishop Dr. Delford Davis and Custos Patricia Dunwell link hands and aims at Wednesday's conference. CHURCH leaders on Wednesday urged Jamaicans to put greater emphasis on improving family life at all levels as we step into a new year. The cry came against the background of alarming end-of-year crime statistics, with a hefty percentage of violent crimes stemming from cases of domestic violence. “We are tired of the guns, tired of the criminality. We need good and stable families. Let Jamaica bloom, let Jamaica blossom. It has to start with us,” said Rev. Dr. Patricia Holness, who was among a host of pastors delivering messages at the 2018 renewal of the ‘Heal the Family, Heal the Nation’ conference, put on by Power of Faith Ministries International, at the National Arena. But, Dr. Garth was quick to emphasize, there is hope and the perpetual possibility of divine healing. “In spite of what is happening in Jamaica, God deh ’bout. It is going to take faith in God for things to change. Put away the fear and things will change in our families and things will change in our nation. Families need to get back to the absence of fearfulness. Do not be afraid as we go forward,” he said. The massive congregation at Wednesday’s conference spanned the range of Jamaican society. Among the dignitaries in attendance were PM Andrew Holness, Opposition Leader Dr. Peter Phillips and Custos Patricia Dunwell (representing GG Sir Patrick Allen), as well as parliamentarians Olivia ‘Babsy’ Grange, Kamina Johnson-Smith, Pearnel Charles, Desmond McKenzie, Delroy Chuck and Mike Henry.